AUDREY HEPBURN as Holly Golightly dressed in a large hat and a little black dress standing in front of Tiffany & Co’s flagship store on Fifth Avenue in New York City captured the hearts of millions around the world in the movie Breakfast at Tiffany’s, and undoubtedly helped propel Tiffany’s and that “little black dress” to unprecedented stardom. Today, more than four decades on, Tiffany’s flagship store still draws throngs of tourists each day, posing in front of the store’s iconic pinkish walls in an attempt to recreate scenes from Hepburn’s unforgettable movie. Tiffany & Co is ubiquitous with style, luxury and impeccable craftsmanship, although its role as one of the world’s main discoverers of new gemstones is somewhat less well-known. Over the years, the company has discovered, named, and popularised many new gemstones — some of which have become much loved indeed, such as Tanzanite. Coloured diamonds, extremely rare and highly sought after are also very much a part of Tiffany’s collections — one of the largest yellow diamonds ever found was purchased by Charles Tiffany, and is now known as the Tiffany Yellow Diamond, and has only been worn by two women in its lifetime. One of whom was of course, Audrey Hepburn in 1961 who wore it for publicity photographs for Breakfast at Tiffany’s. In a remarkable event in the heart of Kuala Lumpur, Tiffany & Co at Suria KLCC has brought in over 90 of one-of-a-kind pieces from Tiffany stores all around the world as a part of its Masterpieces collection. Featuring unique designs by French designer, Jean Schlumberger whose work was inspired by nature as well as pieces by design director Francesca Amfitheatrof, the viewing this collection is a once-in-a-lifetime opportunity for jewellery lovers. 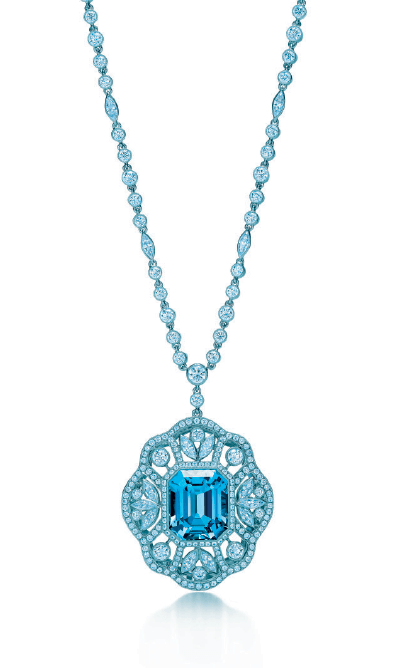 In addition to white diamonds, the masterpieces collection includes necklaces, bracelets, earrings, brooches and rings featuring yellow, blue, green and pink diamonds, blue and pink sapphires, emeralds, aquamarines as well as lesser-known but equally beautiful red spinels, kunzite, morganite and chrysoprase. Some of these gemstones were found and named by George Kuntz (1856-1932), an American mineralogist and mineral collector who became the vice-president of Tiffany & Co at the tender age of 23. Together, all the pieces being exhibited is worth US$13 million (RM48 million) and can be viewed and purchased for the first time ever here. With an innovative approach to jewellery design, the collection combines a mixture of custom-cut princess, baguette and round brilliant diamonds in elegant necklaces, bracelets and rings that exemplify a new clarity and modernity. Each design has discreet details — how the diamonds move or how the elements are linked — that are so subtle only the wearer knows about them, creating a very personal connection to the piece. 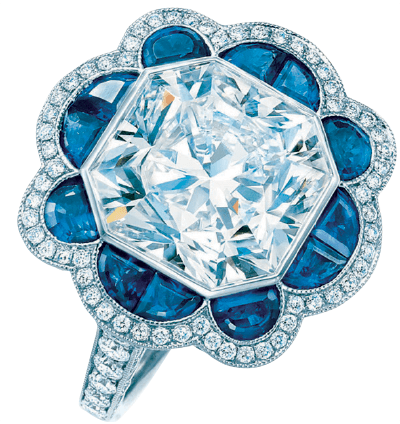 Among the most special pieces in the collection are a Tiffany ring with a platinum-set six carat Lucinda diamond surrounded by specially cut sapphires evoking an evening sky and an earring and an Amfitheatrof-designed bracelet set made from platinum, custom-cut chrysoprase and diamonds which were worn by Julia Roberts at the recent Screen Actors Guild Award. In addition, featured in the collection are several pieces designed by one of the twentieth century’s most gifted artists, Jean Schlumberger — with brightly coloured and exuding elements of flora and fauna — that were greatly loved by the famed Jacqueline Kennedy Onassis. Schlumberger was a master at capturing the natural world around us, modelling precious jewellery after jellyfish, dolphins, petals and leaves. He once proclaimed that his goal was to “capture the irregularity of the universe”; this is reflected strongly in his work. For instance, no two petals on a ring are the same — each differ in subtle ways, mimicking real life. In line with Tiffany’s philosophy, every single gemstone that is sold at the store is certified conflict-free; with diamonds being sourced according to the Kimberley Process Certification Scheme. This ensures that Tiffany, and its consumers by extension do not inadvertently support the unethical mining and trading of precious jewels. The Tiffany & Co Masterpieces collection is on display till March 29 at Tiffany & Co, Ground Floor, Lot G25B, KLCC, KL. For inquiries call (03) 2163 2088.